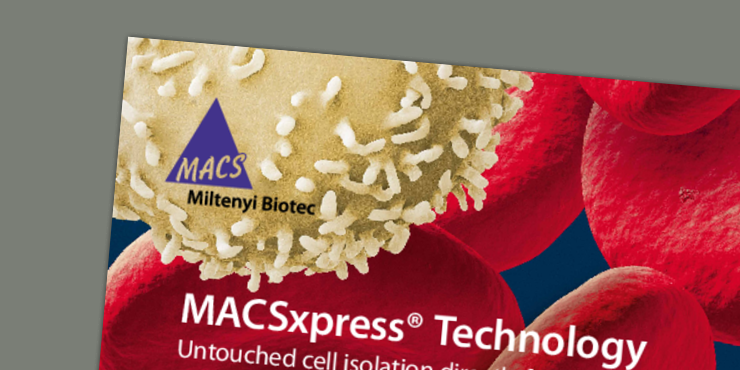 With MACSxpress® Technology, direct isolation of immune cells from human blood has never been easier. It allows processing of large blood volumes of up to 30 mL in one single tube. Without the need for density gradient centrifugation, this technology offers a fast and easy way to isolate viable and functional immune cells from various blood products. MACSxpress Technology is based on micro-sized MACSxpress Beads allowing the removal of non-target cells by immunomagnetic depletion with the MACSxpress Separator, a powerful permanent magnet. Simultaneously, erythrocytes are sedimented, yielding untouched, highly pure target cells such as T cells, B cells, eosinophils, neutrophils, or NK cells. A leukocyte subset isolation with MACSxpress Technology takes less time than a preparative density gradient centrifugation. This short video introduces the main benefits of the MACSxpress Technology and shows the magnetic separation of labeled cells as well as sedimentation of RBCs. Isolate T cells, B cells, NK cells, eosinophils or neutrophils in a fast and untouched manner. 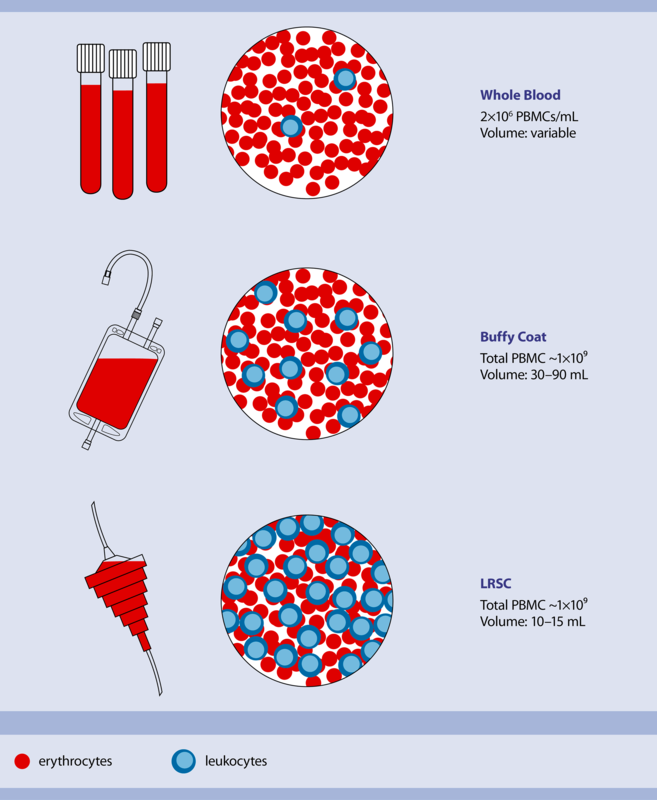 Wheter you want to start directly from whole blood, buffy coat, or LRSC, we offer different MACSxpress Isolation Kits (see product list below). First time using MACSxpress? We offer starting kits containing the MACSxpress Isolation kit of choice, the MACSmix™ Tube Rotator, and the MACSxpress Separator. 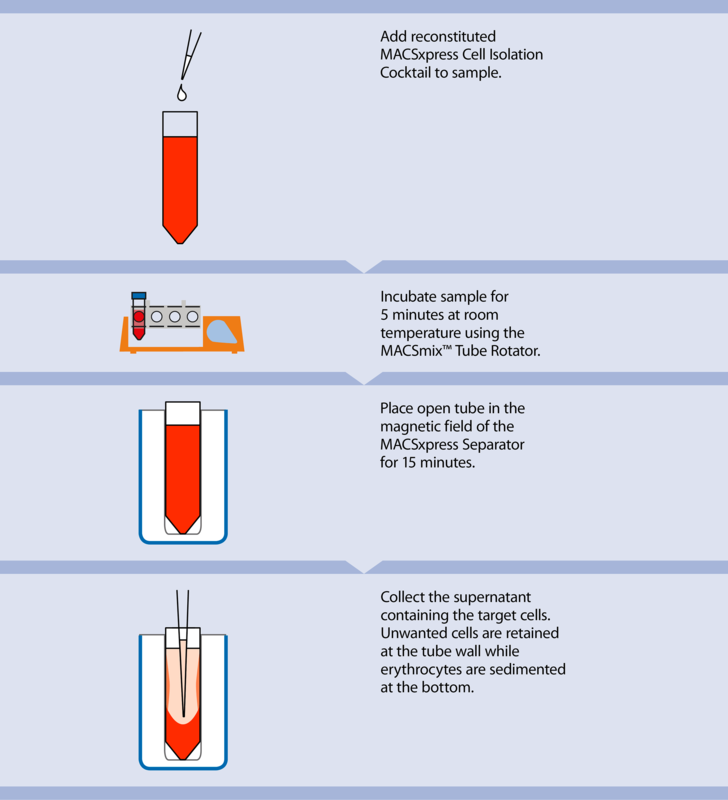 Using one of our MACSxpress Isolation Kits, you get highly pure target cells within 25 minutes. In this example, neutrophils were isolated from whole blood using the MACSxpress Whole Blood Neutrophil Isolation Kit, a MACSmix™ Tube Rotator, and a MACSxpress Separator. 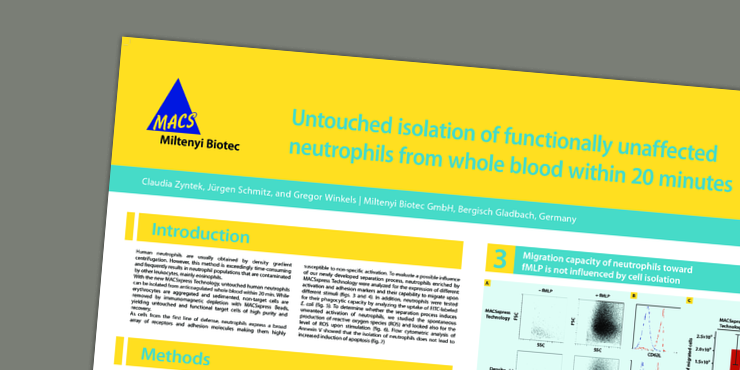 Untouched neutrophils were isolated from 8 mL of human EDTA anticoagulated whole blood using the MACSxpress® Whole Blood Neutrophil Isolation Kit, a MACSmix™ Tube Rotator, and a MACSxpress Separator. The isolated cells were fluorescently stained with CD14-PerCP, CD15-PE, CD16-APC, CD45-VioBlue®, and CD193-FITC and analyzed by flow cytometry using the MACSQuant® Analyzer 10. Cell debris, non-leukocytes, and dead cells were excluded from the analysis based on CD45 expression, scatter signals, and propidium iodide fluorescence. Download the brochure to get all the details on our MACSxpress Technology.